Now that Google Health has finally launched, I took a quick peek at it while Mark was taking notes at today’s Google Factory Tour presentation. It’s been a long time coming, but at first glance it looks like it will be a strong competitor to existing personal health sites such as Microsoft’s HealthVault (which launched last October), Revolution Health, or Aetna’s SmartSource (via a partnership with Healthline). 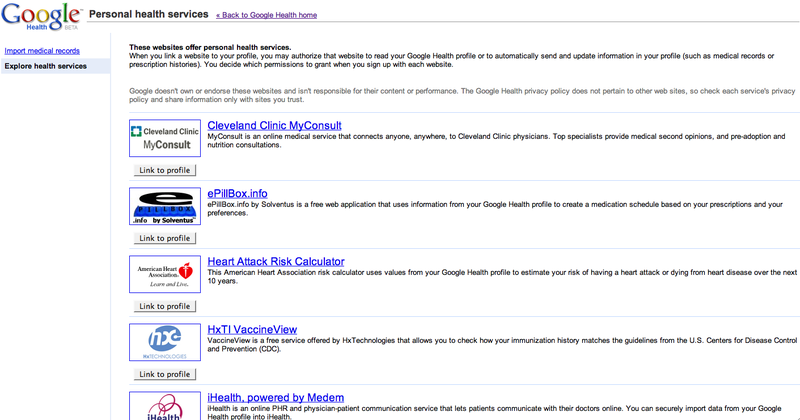 The big competition here is between Google Health and Microsoft’s HealthVault. (Revolution Health is more of an information portal at this point, and who is going to trust their health insurance company?). Whereas HealthVault’s strengths seem to lie in tying together different health information silos on the back end, Google Health is focusing more initially on the consumer side. It is trying to do an end-run around the health establishment by trying to get consumers to manually load their own medical information into their profiles. 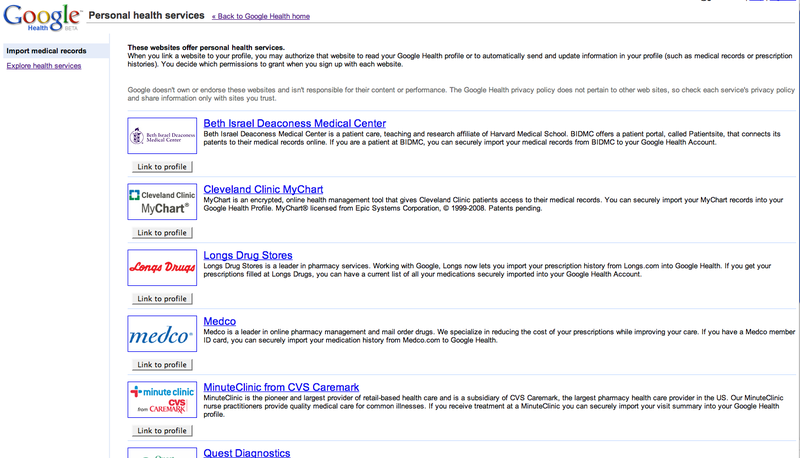 HealthVault allows this as well, but seems to have stronger partnerships with back-end health data providers. Google will no doubt tackle the existing health data silos as it proceeds. It really has no choice if it wants to organize the world’s health information. To gain consumer acceptance, Google promises never to advertise on Google Health (although ads in related searches should be fair game) and that people’s personal health information will never appear in search results (one would hope not). Members can add their doctors to their Gmail contacts and APis are n the works. 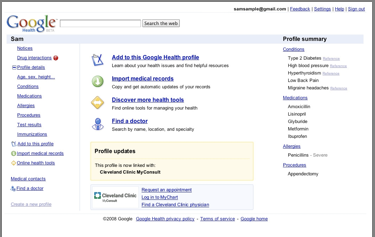 In order for Google Health to be of much use, you need to tell it about your health history by creating a personal medical profile. It is easy enough to get started. You tell it your age, weight, medical conditions, medications, allergies, and so on. 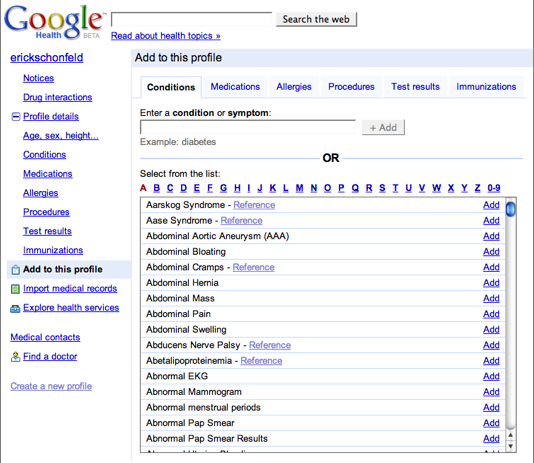 It provides guided keyword suggestions, so that when you type in a symptom, for instance, you get a list of health terms. But the key is importing your medical record in there. That is going to be a huge hurdle in terms of people feeling comfortable giving that sort of data to Google in the first place, and then simply getting the data in an electronic form from their doctors. 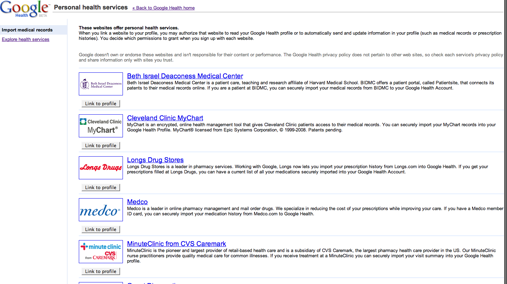 Google Health lists only eight partners so far from which it can import medical records, and half of them only cover drugs (Medco, Walgreens, RXAmerica, and Longs Drug Stores). The others are Quest Diagnostics (for lab tests), MinuteClinic from CVS Caremark, and two hospitals: the Cleveland Clinic, and Beth Isreal Deaconness Medical Center. Even if your doctor sent you a file with your complete medical record, it is not clear that you could upload it (although you could enter it by hand). It also does not let you import data directly from medical devices, a feature that Microsoft’s HealthVault does have. 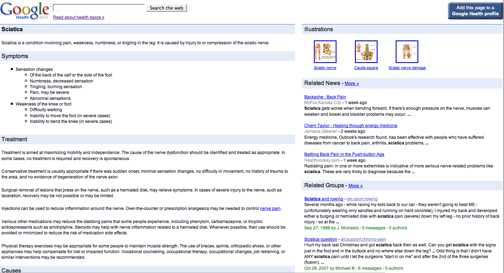 Google has also created specific in-depth pages for hundreds of health topics. When you enter a condition into your profile, there is a reference link to one of these pages where you can do more research. These are really helpful. 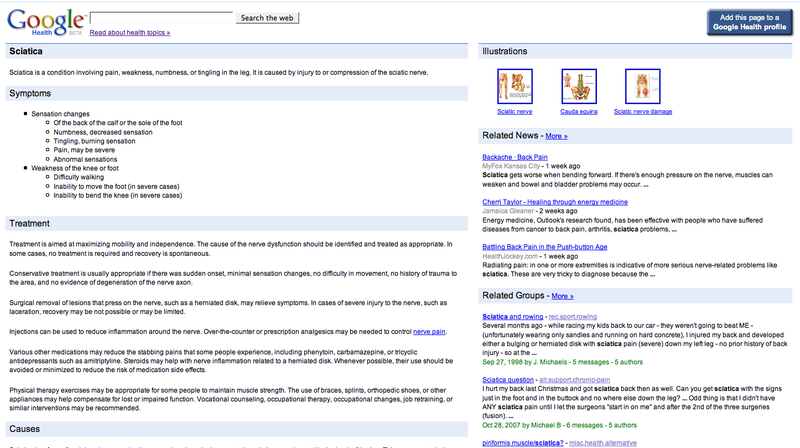 They give a summary of the symptoms, treatment, causes, and prevention of different conditions; illustrations where appropriate, as well as links to related news, Google Groups, and search trends. Here is one for “Sciatica,”for instance. 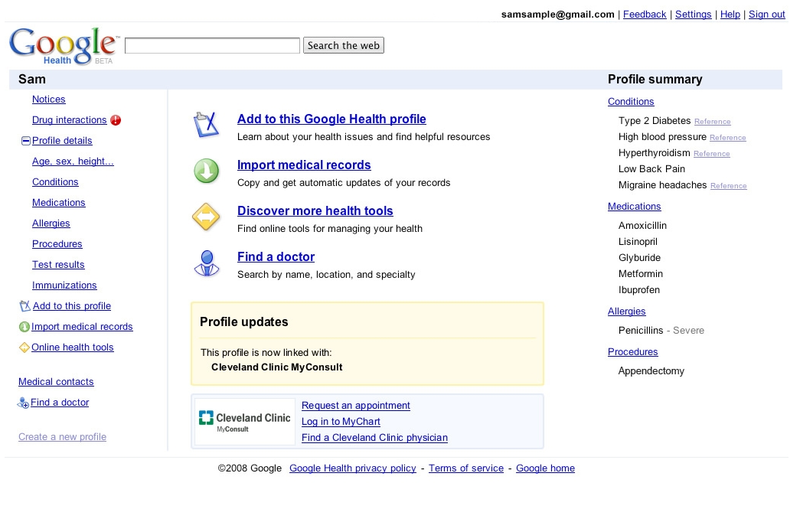 Google Health also lets you link your profile to a number of other online health services. These include ePillBox.info (medication scheduler), a heart attack risk calculator, iHealth, Livestrong.com, MyDailyApple (daily health news), MyMedicalRecords,com, and NoMoreClipboard. 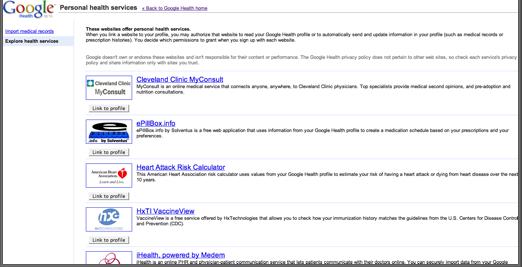 If Google Health wants to be the central repository of your online health profile, it needs to allow you to share your profile with as many other services as possible. You are able to grant different levels of permission to each service. HealthVault has its own list of partner sites (American Heart Association, CapMed, HealthMedia, Healthy Circles, Kryptiq, Peaksware, Pure Wellness,Sound Health Soultions, US Wellness, Podfitness, MyVitalStatistics, Limeade, and Active Health). Google is planning to open up APIs to Google health to make it easy for other partners to tap into its health platform. And make no mistake about it. That is what this is: a platform. Health apps anyone?